Alexander Dennis Ltd (ADL) has announced it’s to add hydrogen fuel cell buses to its current line-up of low and zero-emissions vehicles. 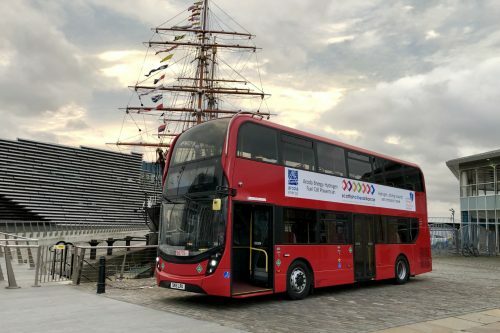 A prototype Enviro400 double-decker has been developed in partnership with fuel cell system integrators Arcola Energy – a process which has taken over two years. The hydrogen-powered vehicle has an electric driveline with axle-mounted motors. The on-board battery is charged by feeding hydrogen from secure tanks to a fuel cell system where it is converted to electricity. No external battery charging is required, and the vehicle’s only emission is water vapour. The prototype has undergone a number of design changes during the development process in a bid to optimise performance and ensure regulatory and safety compliance. It has successfully completed route shadowing trials in several UK cities, and has demonstrated ‘the highest efficiency and therefore the lowest fuel cost in its class,’ according to ADL. Order books are now open for the new vehicle, and ADL will continue to work with cities, operators and other stakeholders around the UK to demonstrate the vehicle’s potential on fleet trials. Fuelling infrastructure and hydrogen supply can be handled by one of ADL’s partners.